… BB krém má pôvod v Nemecku? Bol vyvinutý r. 1960 a mal chrániť a kryť jazvy pacientov po operáciách. … revolúcia v kozmetickom priemysle nastala r. 1985, keď bol BB krém predstavený ázijskej klientele a stal sa veľmi obľúbený v Kórei a Japonsku, kde bol nazývaný taktiež ako “tajomstvo kórejských herečiek” a tento boom pokračuje až do dnešného dňa. … BB krém je dnes uznaný ako multitalentovaný a propagovaný ako all-in-one kozmetický prípravok, ktorý má nahradiť hydratačné sérum, primer, foundation a opaľovací krém s uv faktorom. … BB cream originated in Germany? It was developed in 1960 to protect and cover the scars of patients after surgery. … revolution in the cosmetic industry came in y. 1985, when the BB cream was introduced to Asian clientele and became very popular in Korea and Japan, where it was also known as "the secret of Korean actresses," and this boom continues to this day. … BB cream is today reputable as a multi-talented and promoted as all-in-one cosmetic product which is intended to replace hydrating serum, primer, foundation and sun cream with UV factor. The Oriental Gold Plus BB Cream od značky Skin79 je môj prvý BB krém vôbec. Neupredňostnujem bežné makeupy, ale je pre mňa veľmi dôležité zjednotenie farby pleti, zakrytie menších nedostatkov ako napríklad rozšírené póry a zdravý odlesk pleti. Na toto sa The Oriental Gold Plus BB Cream ukázal ako ideálny. Napomáha k dokonalej pleti a poskytuje jednoduchú, rýchlu a efektívnu alternatívu v starostlivosti o pleť. Po použití bola moja pokožka hydratovaná, krém ju nezaťažil a poskytol pocit sviežosti. Súčasťou tohto BB krému je lesk na pery s jahodovým odtieňom a s malým praktickým zrkadielkom, v hornej časti uzáveru. Dokonalosť sama. Za tento multifunkčný obal, pridávam hviezdičku. Zlaté balenie celkovo pôsobí veľmi elegantne a s dekadentnou dávkou luxusu. 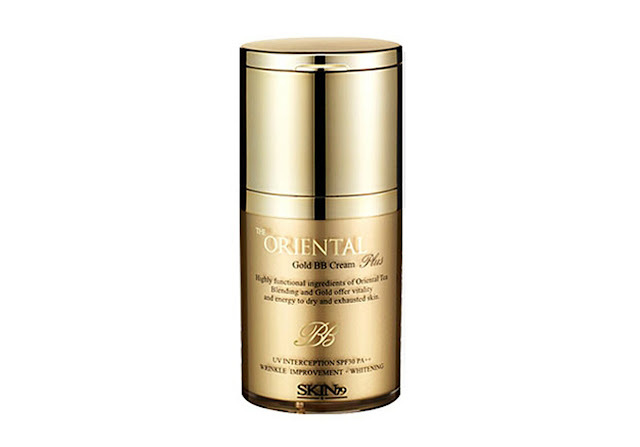 The Oriental Gold Plus BB Cream from Skin79 brand is my first BB cream ever. I do not favor the usual make-up, but is very important to me unification of skincolor, covering small deficiencies such as pores and a healthy glow of skin. For this is The Oriental Gold Plus BB Cream ideal. It helps for the perfect skin and provides a simple, fast and effective alternative in skin care. After use, my skin is hydrated, soft and the cream gave skin a feeling of freshness. Part of this BB cream is a lip gloss with strawberry shade of color and with a practical small mirror on the top of the cap. Just perfect. For this multi-functional packing, I give the star. The gold packing looks overall very elegant and with decadent amount of luxury. BB krém nepoužívám, ale možná bych se po nějakém měla kouknout. Well I didn't knew . My favourite one ist the one from Dior ! Že.? No úprimne, očakávala som, že aj BB krém bude s nejakým odleskom, ale bohužiaľ nie je. BB cream sounds really useful, I have to get myself some and see it it works on me! Do you think there are any stores that give samples to test it first? ohmygosh this is so cool!!! this would be awesome to travel w/ can't get over how it comes with lip gloss on the top love that!! Let me know on blog and I will follow back straight away! Vypadá to pěkne a ten lesk se mi moc líbí! I was in Asia when BB cream was HUGE there a couple of years ago, but I don't think I've ever found one that works for me... Hmm, maybe those new CC creams? I don't know it but thanks for share! My friend is ALWAYS talking about how she wants to try BB Creams, haha! Just wish they were a bit more affordable!